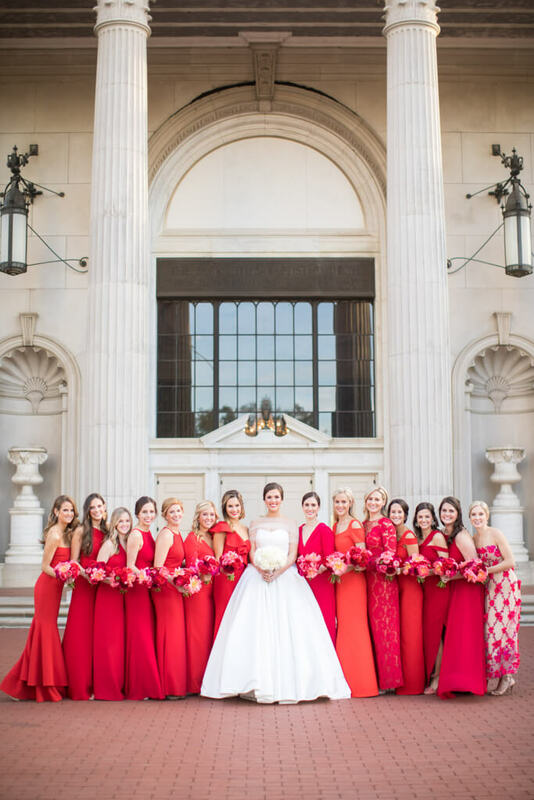 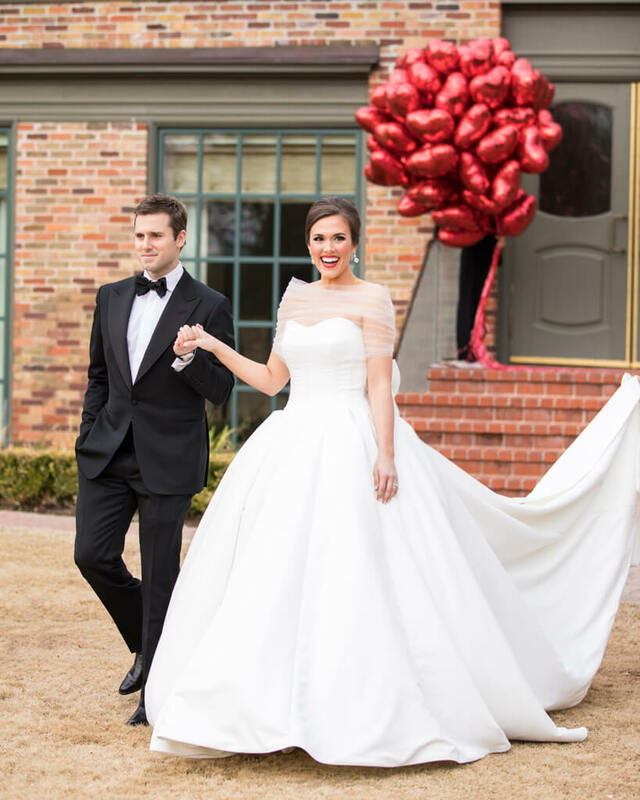 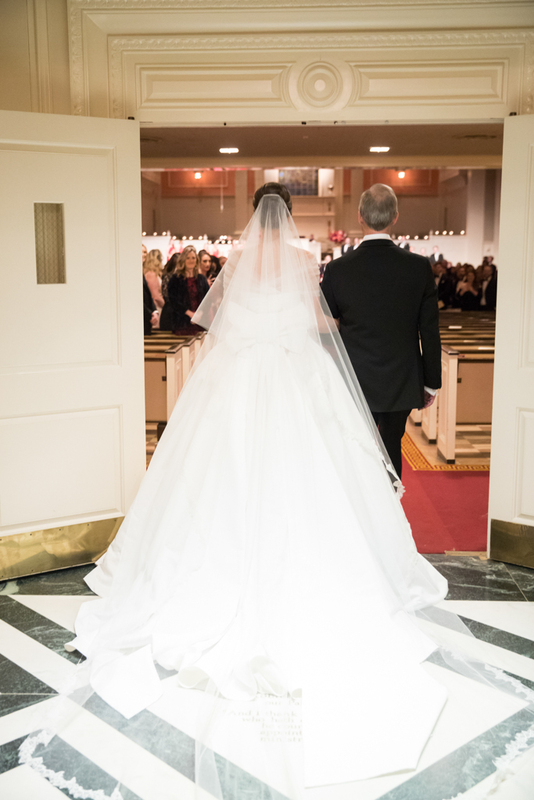 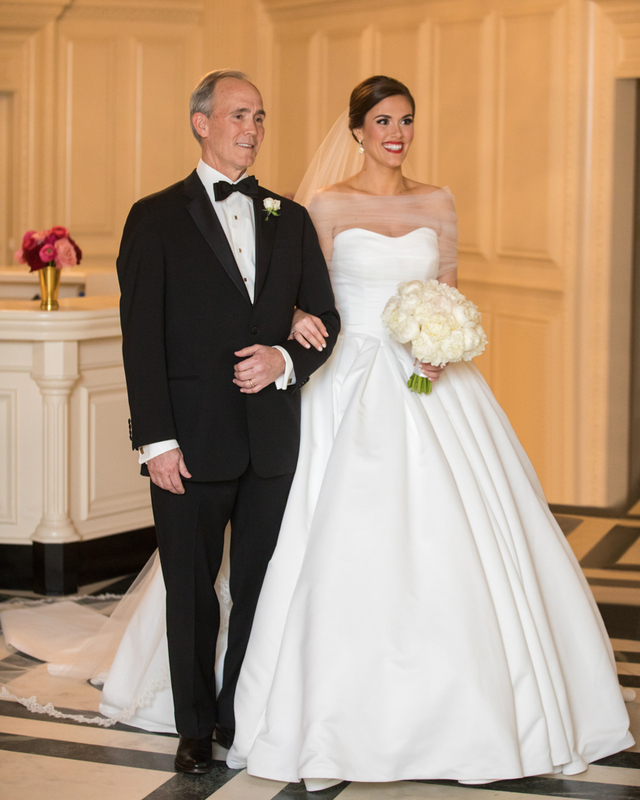 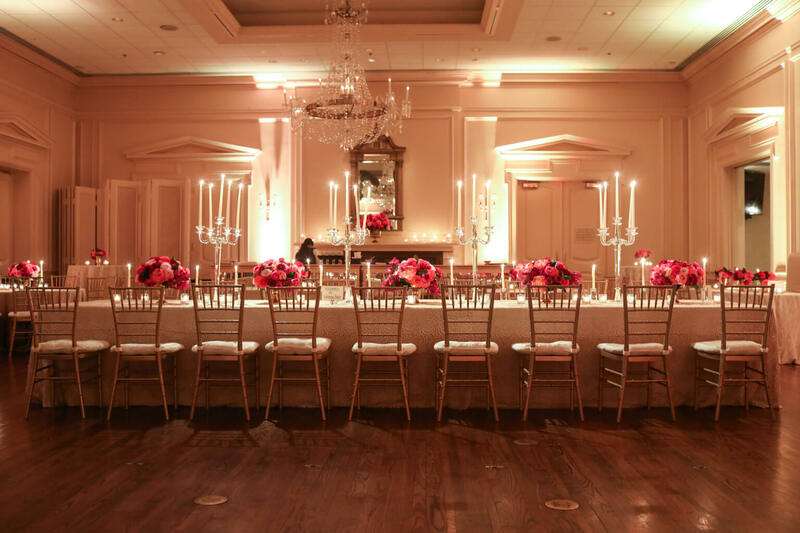 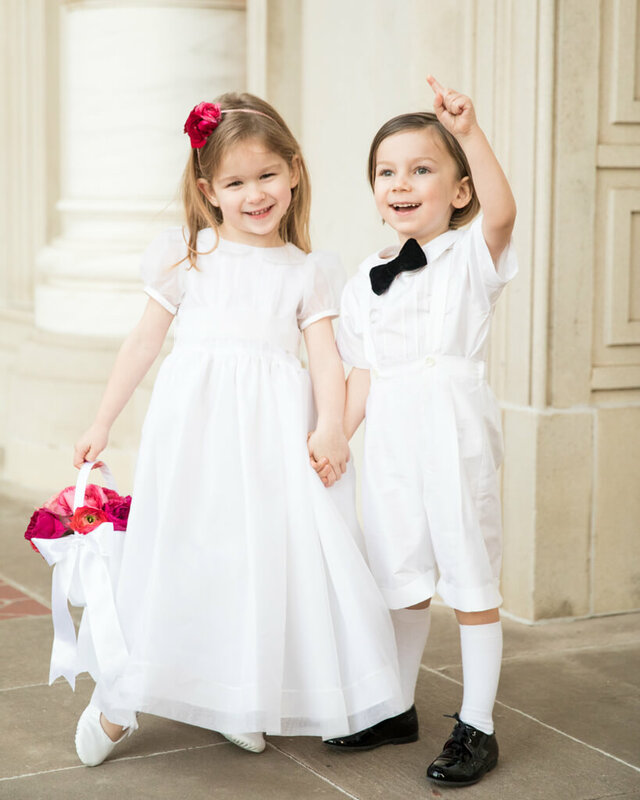 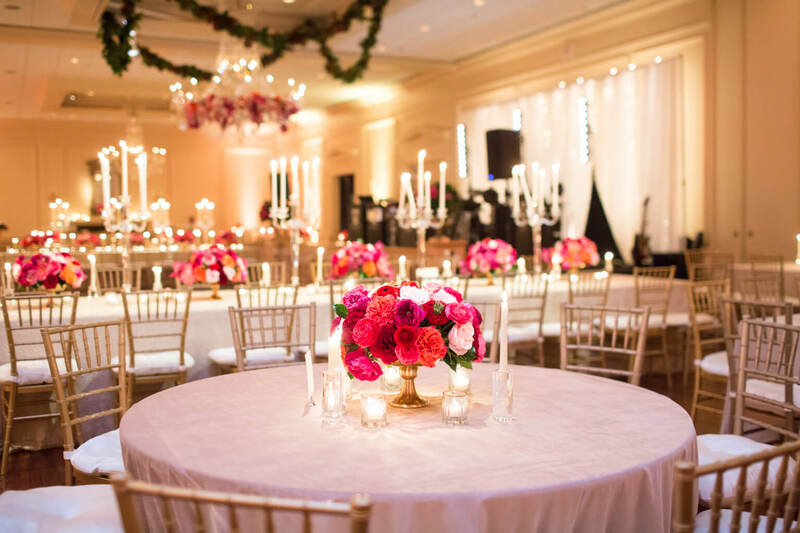 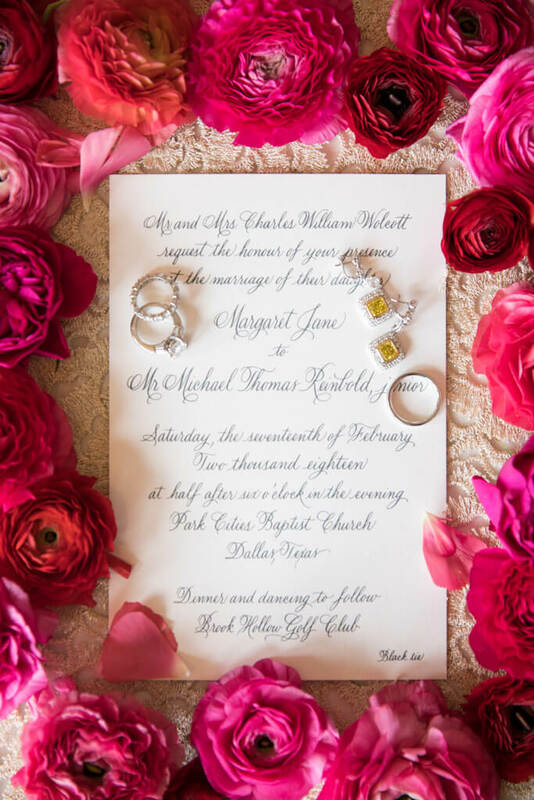 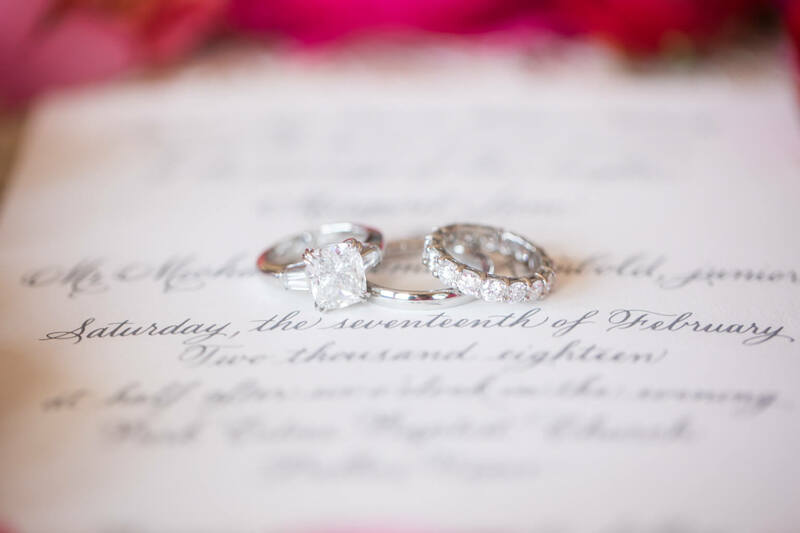 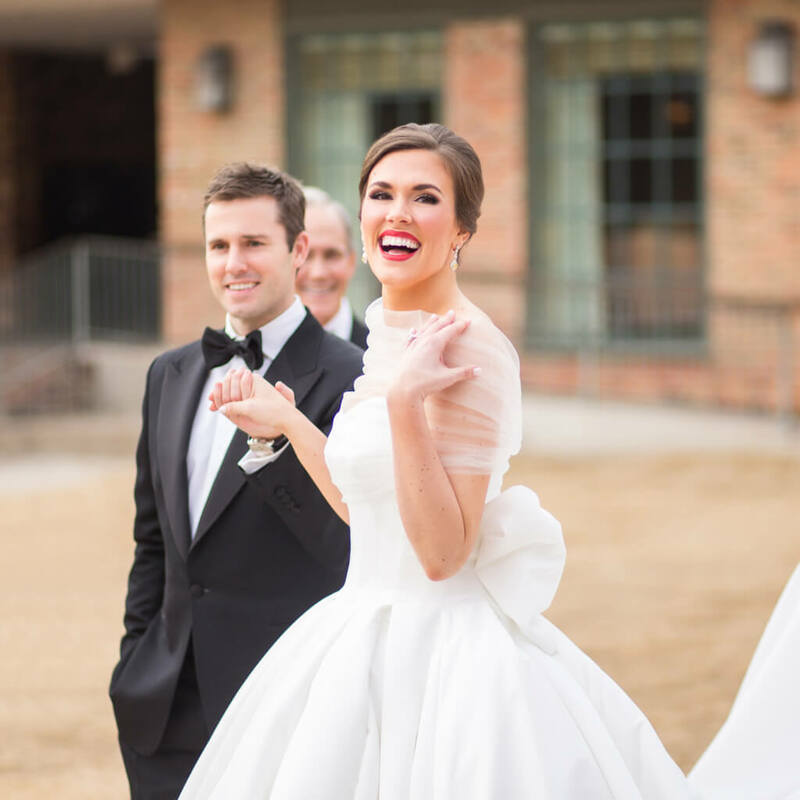 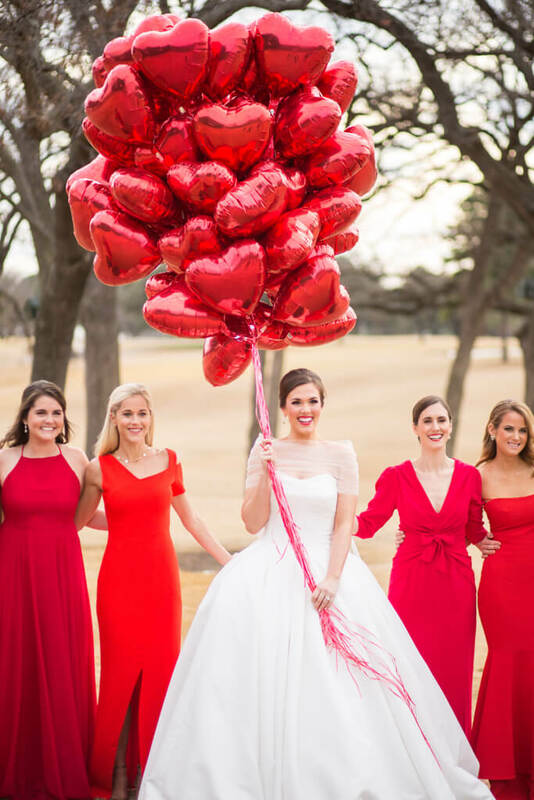 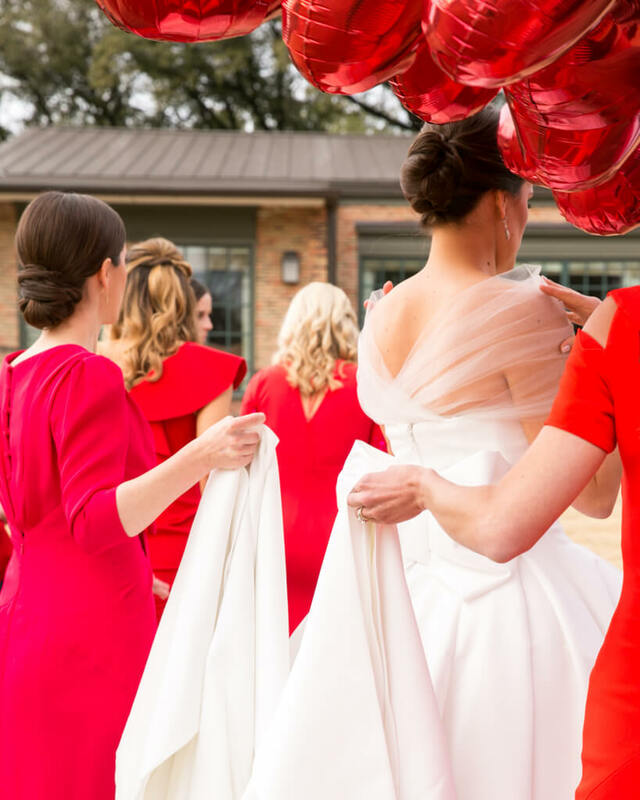 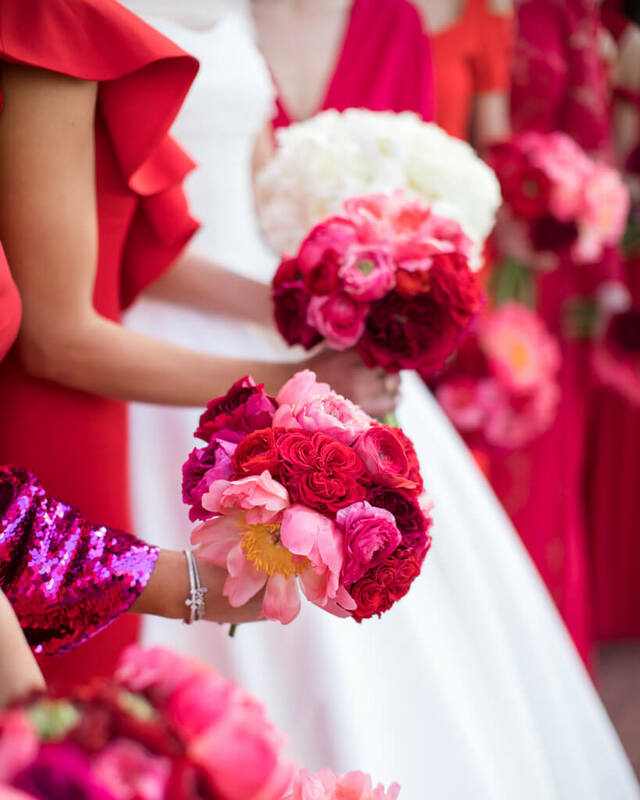 For their February nuptials, Margaret and Michael planned a Southern fête featuring a romantic color palette of pink and red with gilt accents. 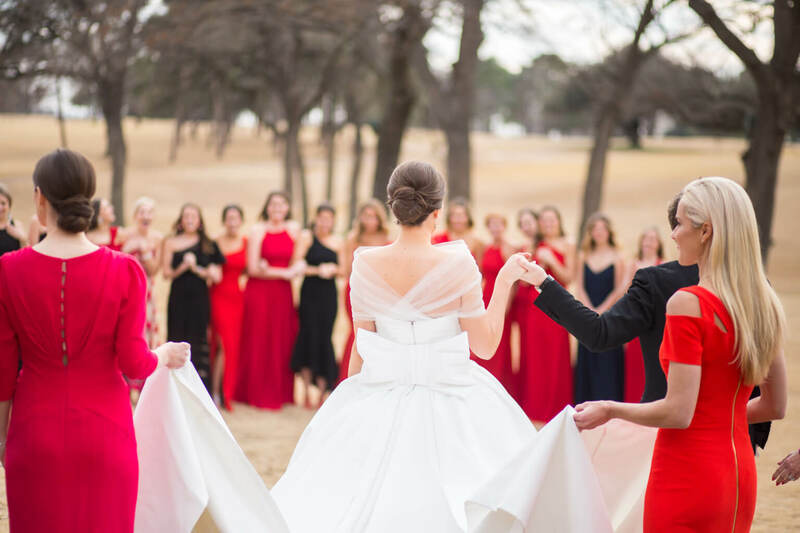 Park Cities Baptist Church served as the site of the traditional vow exchange. 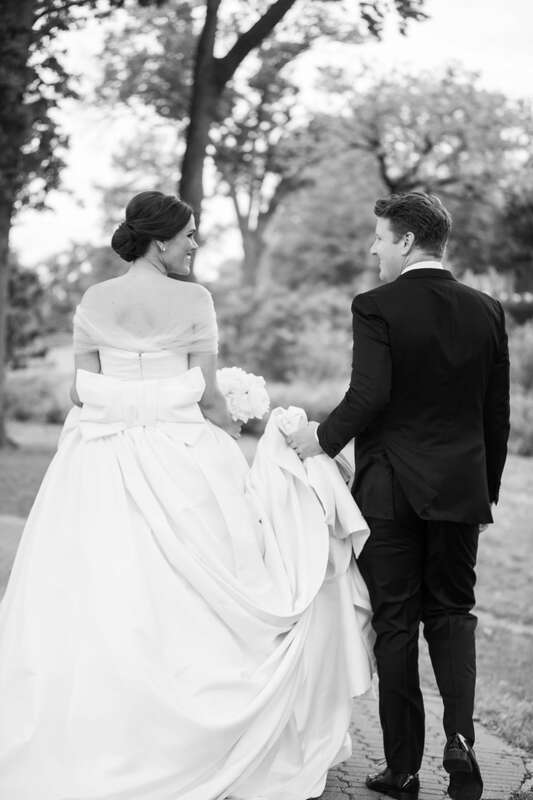 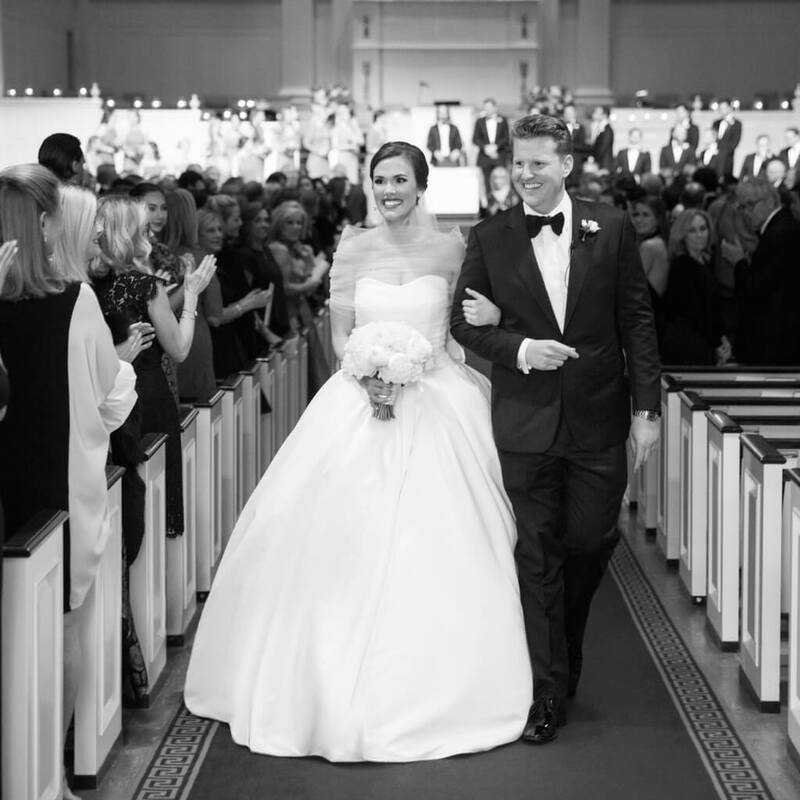 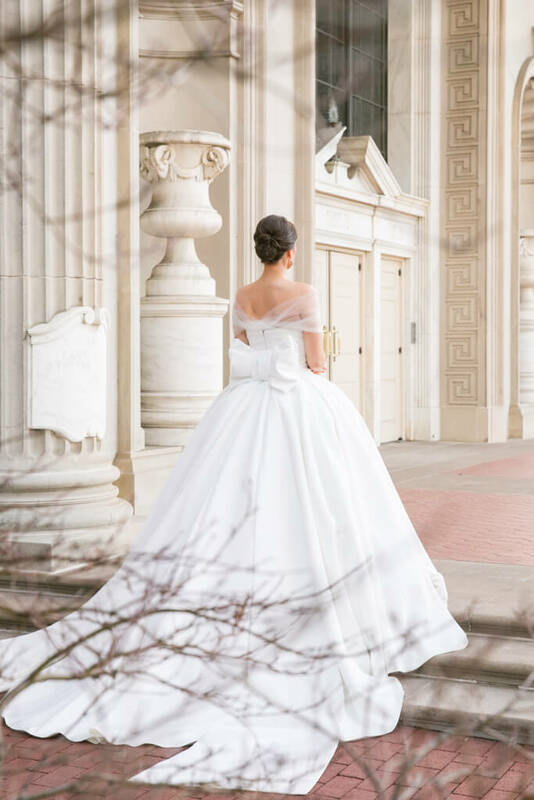 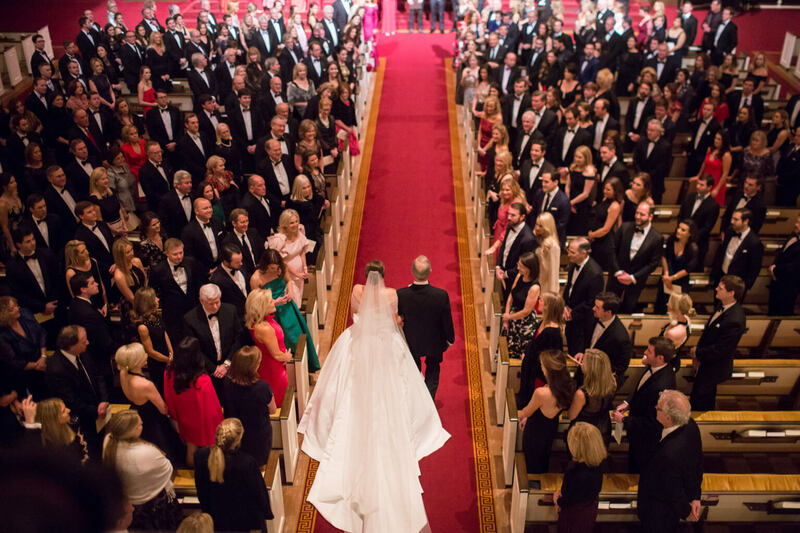 The bride walked down the red carpet aisleway in a beautiful crepe gown by Viktor & Rolf showcasing an exaggerated bow in the back and a stunning Toni Federici veil trimmed in Alençon lace. 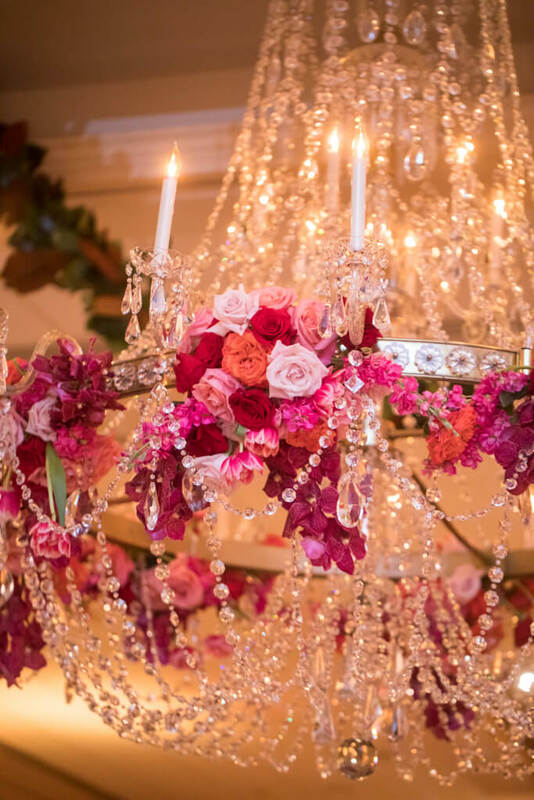 Gold vessels filled with orange, fuchsia, and deep red blooms were placed on both sides of the altar as loved ones witnessed the service. 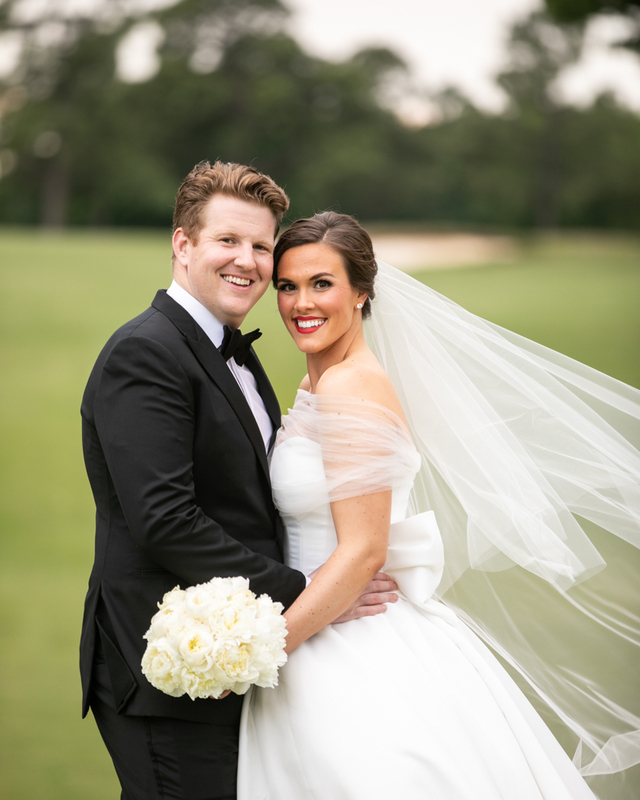 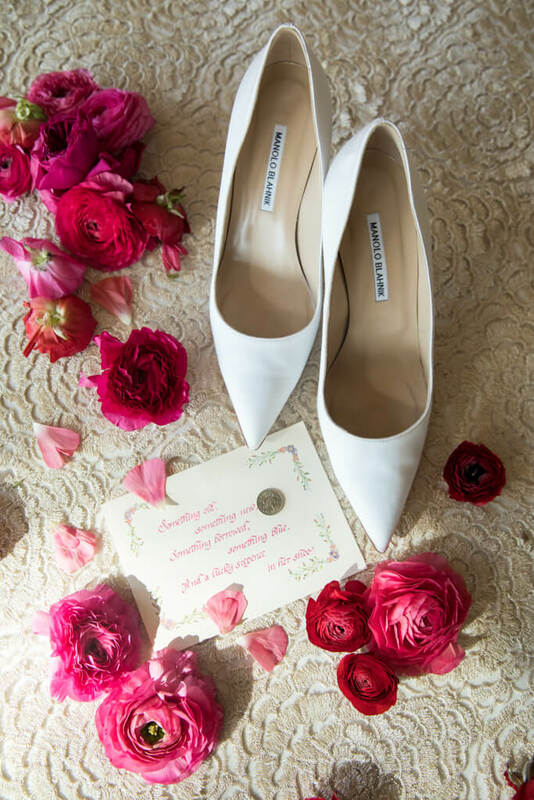 Once Margaret and Michael were pronounced husband and wife, they joined friends and family at Brook Hollow Golf Club for the reception. 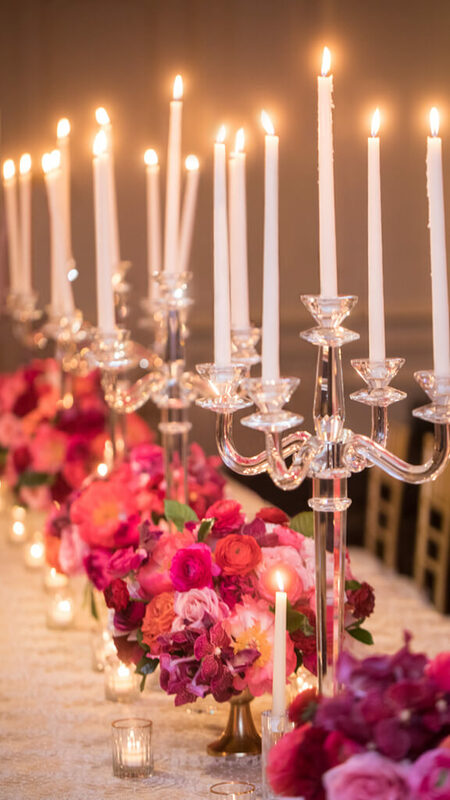 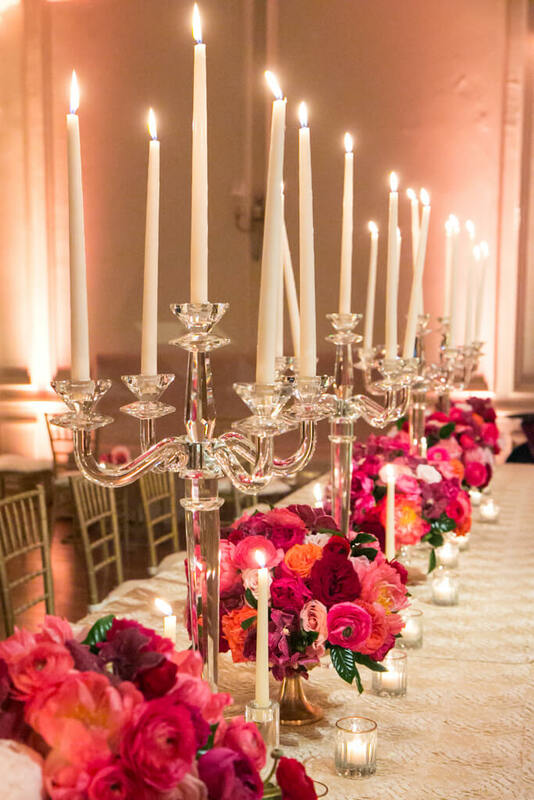 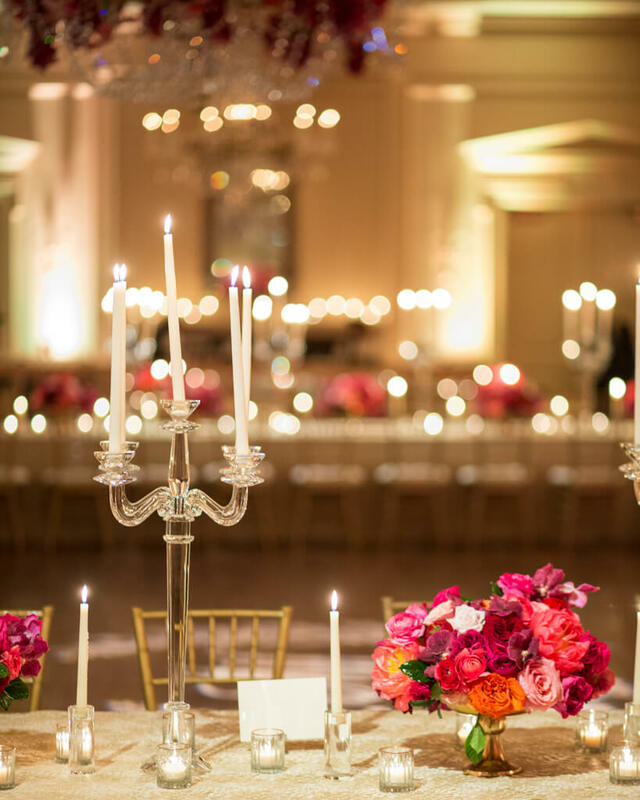 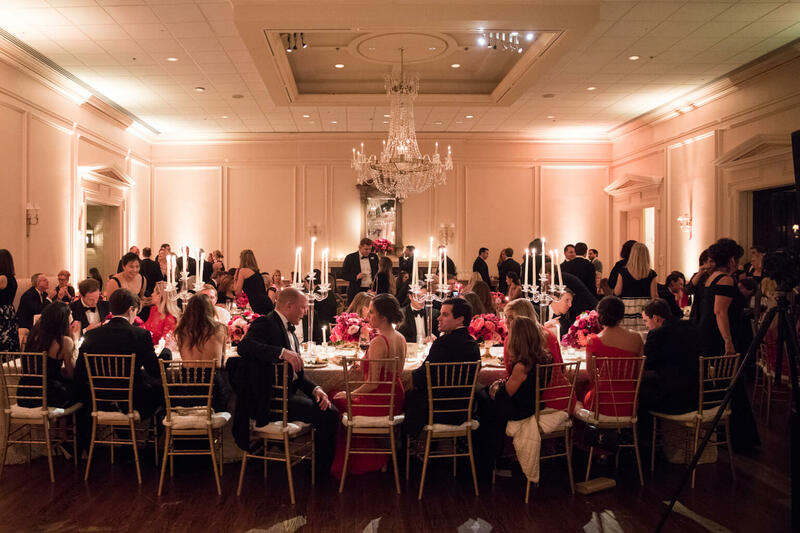 Tables were decorated with beautifully textured linens topped with crystal candelabra and low arrangements of pink, red, orange, and ivory blooms in gold footed vessels. 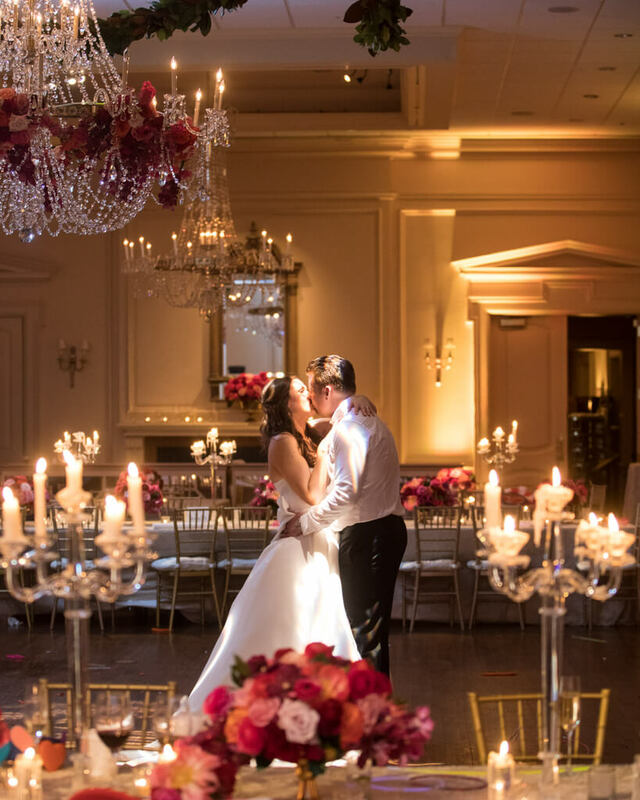 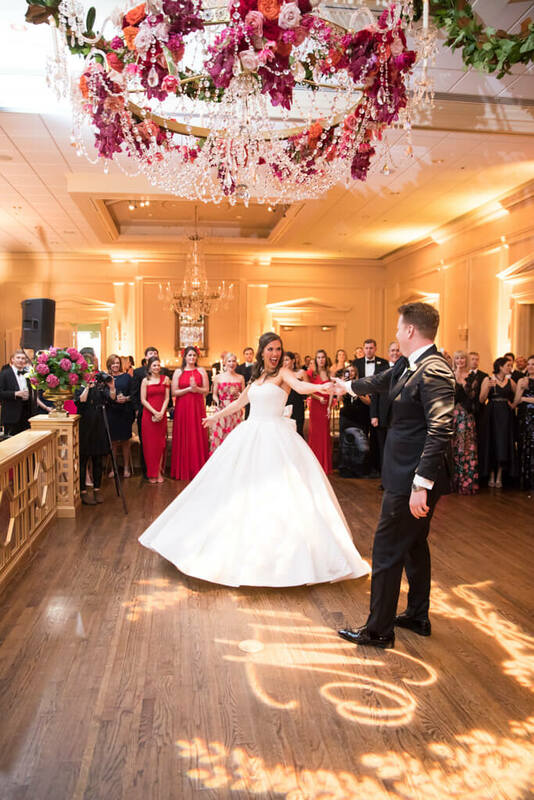 A massive crystal chandelier adorned with similar blossoms was placed above the wood dance floor, which was illuminated with a projection featuring the couple’s monogram. 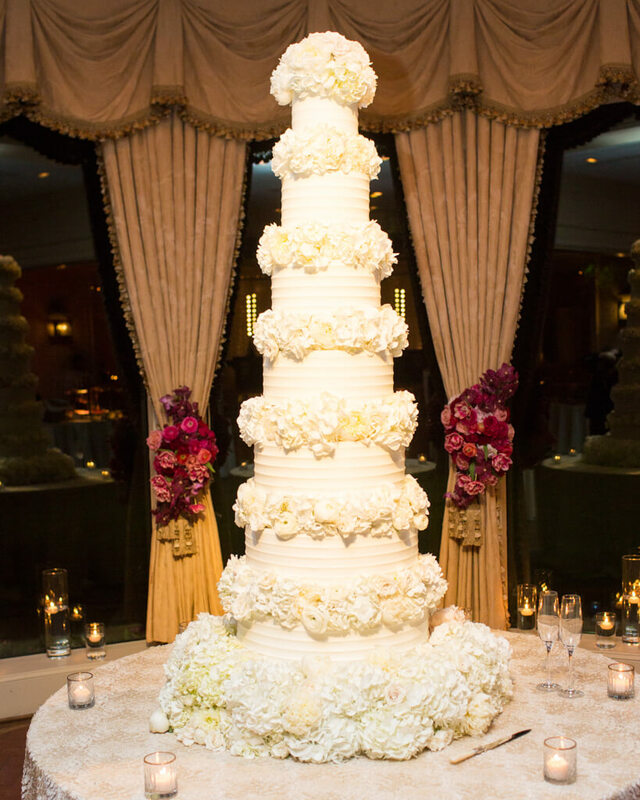 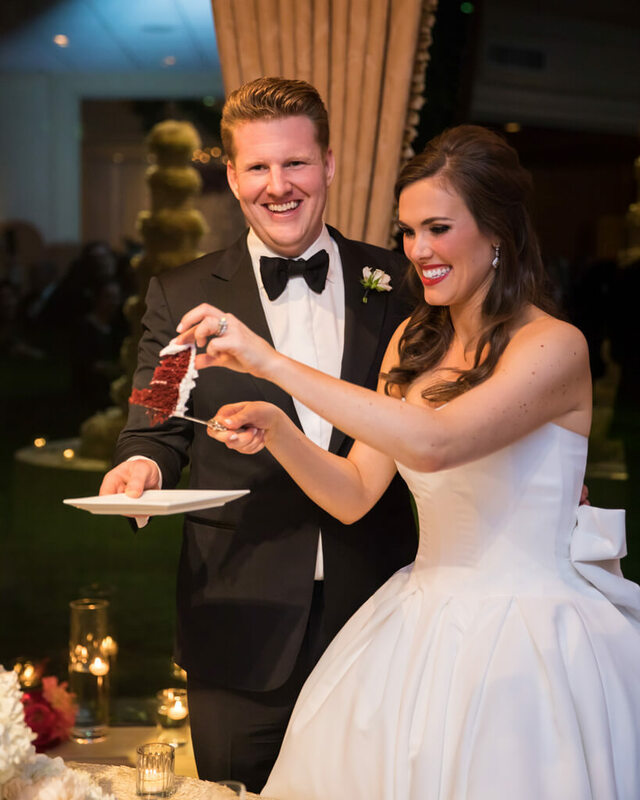 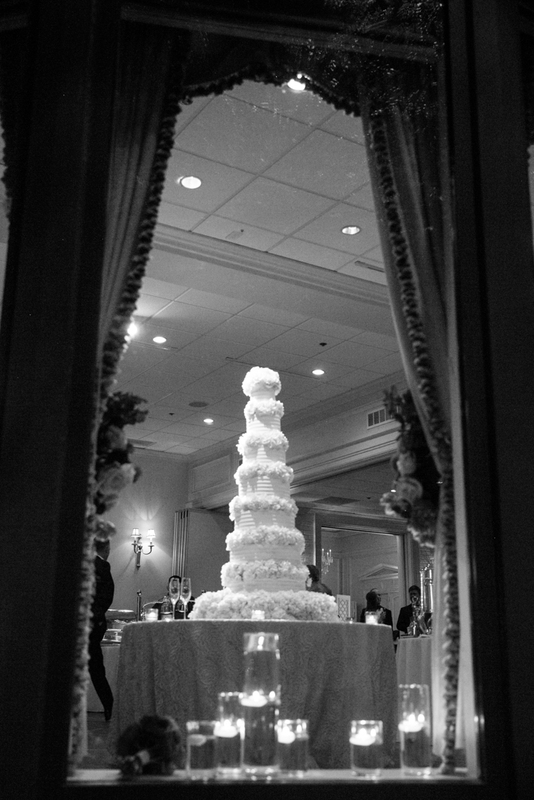 After dinner selections and slices of a towering seven-layer red velvet wedding cake were enjoyed, a live band kept guests entertained for hours. 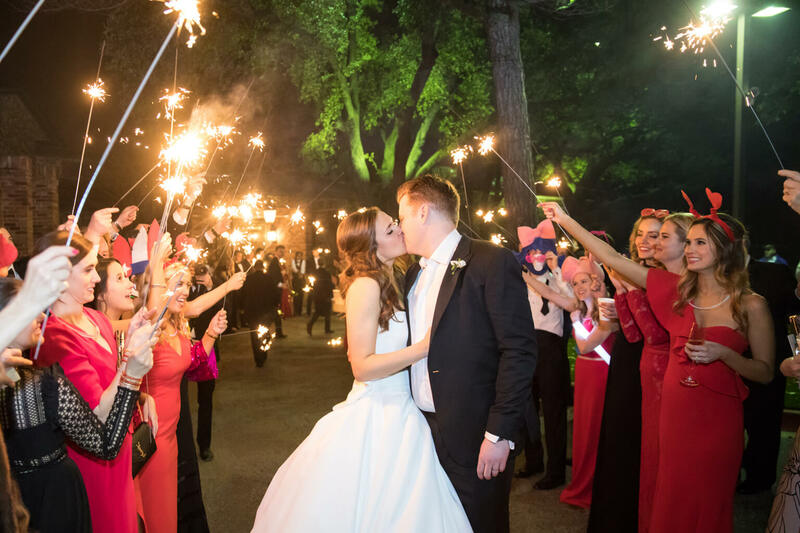 Celebratory music and fun props, including heart-shaped glasses and glow-stick necklaces, kept revelers on the dance floor until the newlyweds’ memorable sparkler exit.